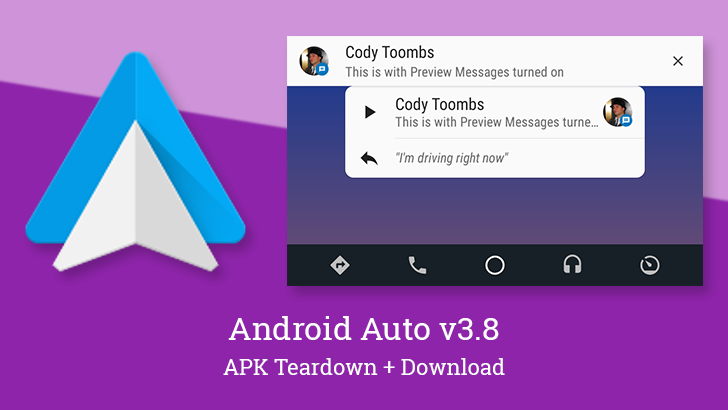 The latest Auto update is rolling out and it's making a couple of substantial changes, at least by the standards of an Auto update. 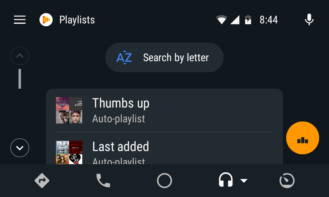 You'll now have the option to see the first several words of incoming messages when they arrive, and the music player has been given a makeover that changes both its looks and a little bit of functionality. It seems this update is rolling out to a pretty small number of people right now. Left: Previews on. Right: Previews off. 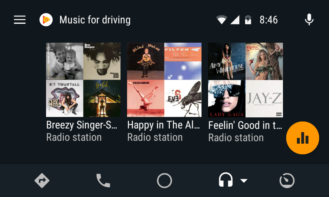 For much of Android Auto's life, many users have questioned if the interface was designed with so many restrictions that it had been made "too safe." Safe is safe, but the restrictions were sometimes so overbearing that users went out of the way to work around the blocks that were became more unsafe than they would have been otherwise. But it seems a better balance is being struck since the development team switched to a dismissable lockscreen for the attached phone and added access to the full contact list earlier this year. 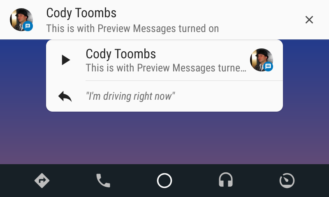 Around the same time, there were clues that Google may also add visual previews of incoming messages, but only when the car is stopped. It turns out this has come true, and you can now enable it in the latest version. 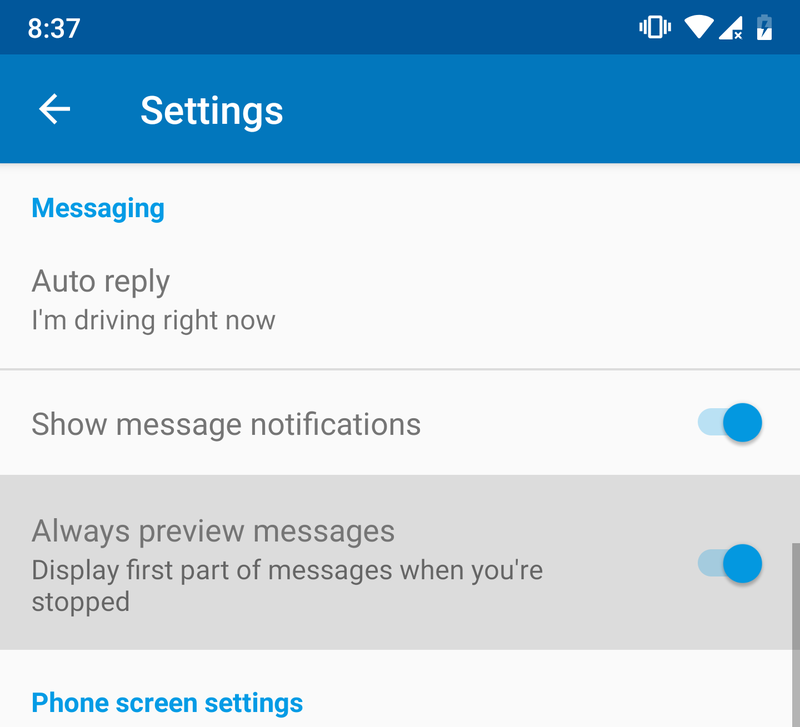 The new toggle for turning on message previews is in the Settings screen within the Messaging group. 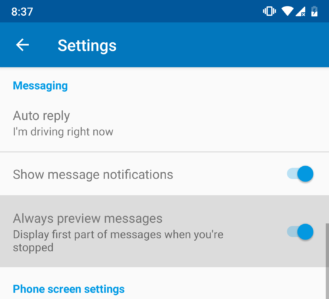 It's disabled by default, so you'll continue to see notifications without message previews unless the setting is intentionally changed. There will surely always be questions about how safe it is to read something from the screen while on the road, but keep in mind that these previews are only supposed to appear when the vehicle is not moving. The length of what is shown is also quite short. As the screenshot above shows, the pop-up notification can show about one short sentence, and the home screen card allows even less. This certainly isn't enough for a dense conversation, but would be fine for brief responses. More importantly, it'll be fantastic for those instances when somebody is sending a message with the name of a meeting place, a street address, or a gate code... All things that you'll want to read from the screen rather than hearing them said by a synthesized voice. New player screen and playlist view. 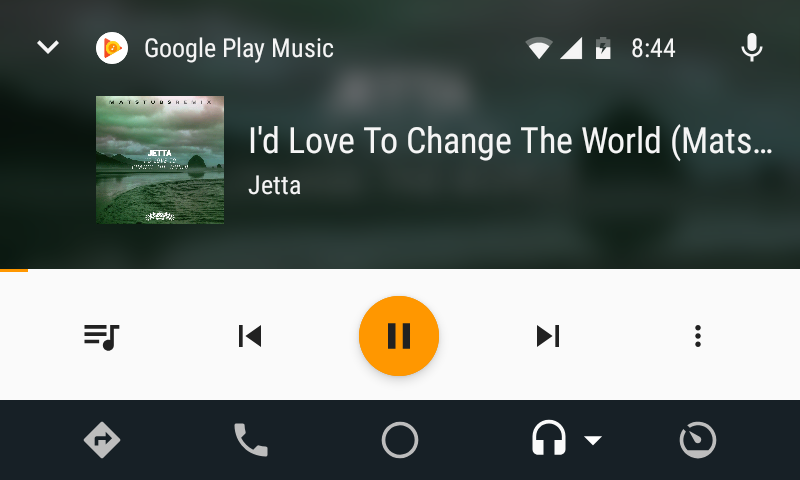 The other big change in this update is a visual, and semi-functional change to the music player interface. The shots above come from the latest version while the shots below are from the previous update. 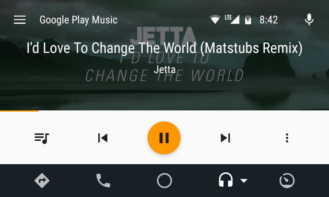 The main player screen hasn't changed in any functional way, but the cover image is now shown as a thumbnail on the left with the title and artist set just to the right. The cover image is still used in the background, but it's heavily blurred in the new version. 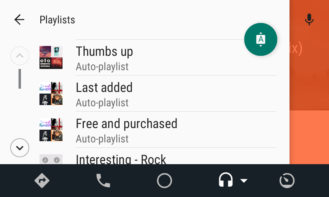 Old player screen and playlist view. 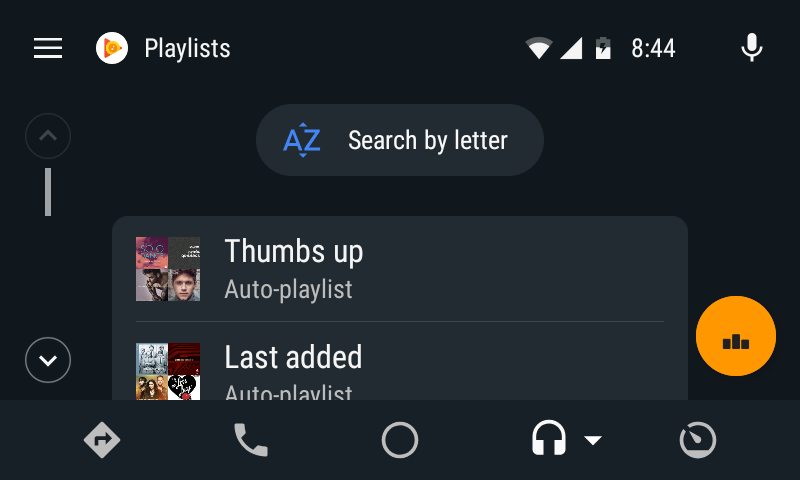 The list screens are also updated with a dark theme and the search function has been given a more prominent position at the top. There's also an animated floating orange button on the far right that will return you directly to the player screen. The floating button isn't the only functional addition. If you look close at the new player screen, you may notice that the hamburger menu has been replaced by an arrow. Tapping on it will hide the player and present an interstitial screen containing the Music For Driving playlist recommendations. The hamburger menu is now accessible from this screen. 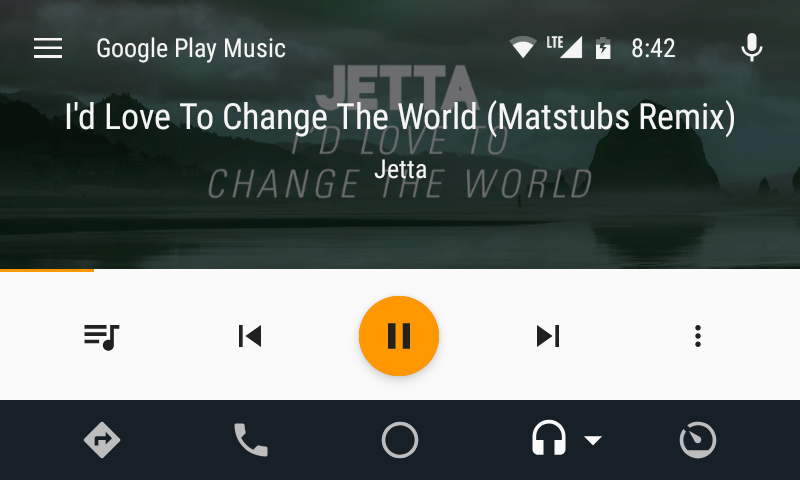 Between changes to the color scheme and putting these recommendations in behind the player, the interface looks much nicer. And if you happen to like the recommendations that come through the Music For Driving playlists, this is probably a great thing. 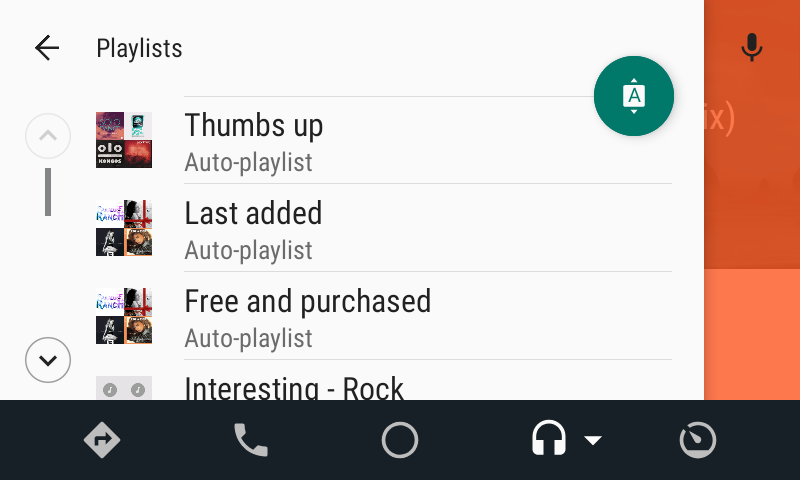 However, I expect the majority of people will prefer their own playlists, and those now require an extra tap to reach. To go along with the message previews discussed above, a new line has been added that will probably serve as an indicator of incoming text messages containing a picture. In my testing, it seems that picture messages are effectively ignored or treated just as text messages if they also contain words, so it seems safe to say this isn't operational yet. I wouldn't bet on pictures actually being displayed on the screen, that seems a bit too ambitious right now, but I'm not sure it can be ruled out so long as the vehicle isn't moving. A couple of curious things popped up in relation to keyboards with this update. First is a new line that tells users the keyboard on their phone is active, and the other is a configuration file called input_keyboard_layout_with_external_keyboard. It's possible, and even likely that these are used by developers exclusively for debugging purposes. There's also no evidence that these two things are connected, they may both simply be about keyboards, but it's worth considering that they might be related to user-facing capabilities. This might be the beginning of a keyboard displayed on the phone for use by a passenger to search for things that aren't easily found by voice, like complicated names. Obviously there's no way to prevent drivers from using something like this, which would clearly be a bad thing, but we're just speculating at what could be in development.